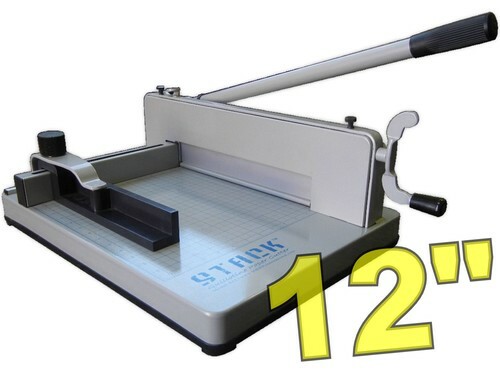 STACK® S12 Paper Cutter. High quality paper cutter at a great price. Right out of the box you will notice the quality of this machine. The blade is a hardened steel, razor sharp, extra long 12" blade. It will easily cut a stack of 20lb paper, 350 sheets high or approx 1.4". The blade lasts for hundreds if not thousands of cuts. However, should you ever need to replace the blade, this cutter is designed so that it is very easy to do. Unlike other heavy duty paper cutters that require you to disassemble the entire cutting assembly, the STACK® S12 paper cutter has an easy replaceable blade. Simply use the included Blade Replace Handle to hold the blade while you remove the screws that hold the blade in place. The blade comes right off and a new one can be put on just as easy. This is a huge plus as most people who need the blade replaced on other heavy duty paper cutters will have to send it back to the manufacturer for blade replacement due to the high difficulty and danger of replacing other paper cutter blades. The STACK® S12 Paper Cutter is ideal for Schools, Churches, small and large Businesses, Print Shops and much more. Extra long cutting bar increases leverage - cut as much as 350 sheets of 20lb paper effortlessly! on 3/3/2013 Love it, love it, love it. I don't know what else to say other than, I just love this guillotine. I operate a small print center, and this guillotine just makes cutting and trimming jobs so much easier. this is a must have.